I cleared out old form data to clear space, but it did not work. I also emptied the trash, but that did not do anything. 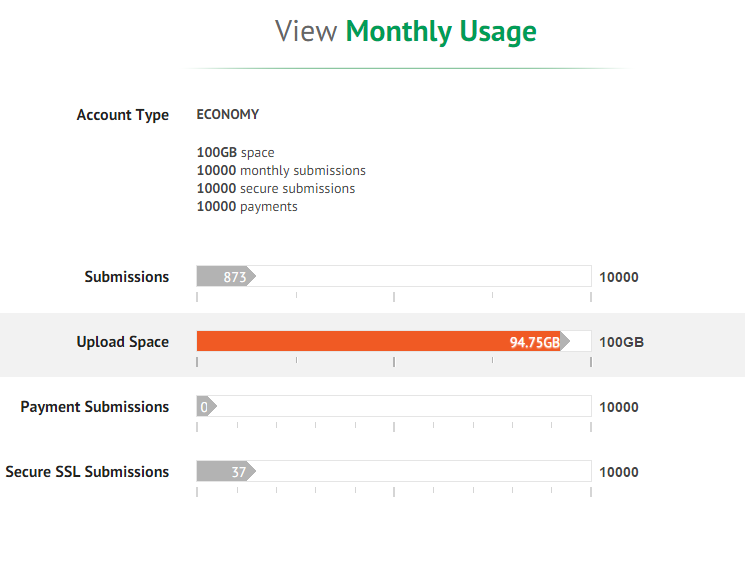 Is there a way to determine which forms are using the upload space so I can clear them out. I also noticed the upload GB number is exactly the same as it was before I cleared out my largest form that had attachments. Is something up with it? Unfortunately, there is no tool to determine which forms have the most upload used. You wil have to manually view the form's submission data at the View Submission page to be able to check existing submission upload. So, the only way to do this is to go to your forms that you know have uploads on them, and check its submission data. Deleting the submissions that have submission upload is the only way to decrease and clear upload space used. Though it will take at least 24hrs before the clearance can take effect on the account status. Please try checking again later if the decreased in your account upload space usage have updated already. I have done a lot of clearing out of old submissions and we have not seen any change in out usage. NOPE.... ignore that. I found the data that was taking up our space. this can be closed.